Kos is relatively easy to get around especially out in the east around Kos Town where it is pretty flat. Our Airbnb hosts recommended to us where we could explore via bikes and what we would need a car for. Kos is only 40km by 8km so it was easy to see everything we wanted to by car in one day. The rest we did over a few days either by bike or foot. This post will be broken down in to each place we visited and brief description along with a little review of our car rental company. This little village is only a few km or so from Kos Town and was where our Airbnb property was located. Platani is also the gate way to the Asklepieion site. You can find several places to eat in Platani and the sunsets are fabulous from here. Apart from that it is a very residential place. 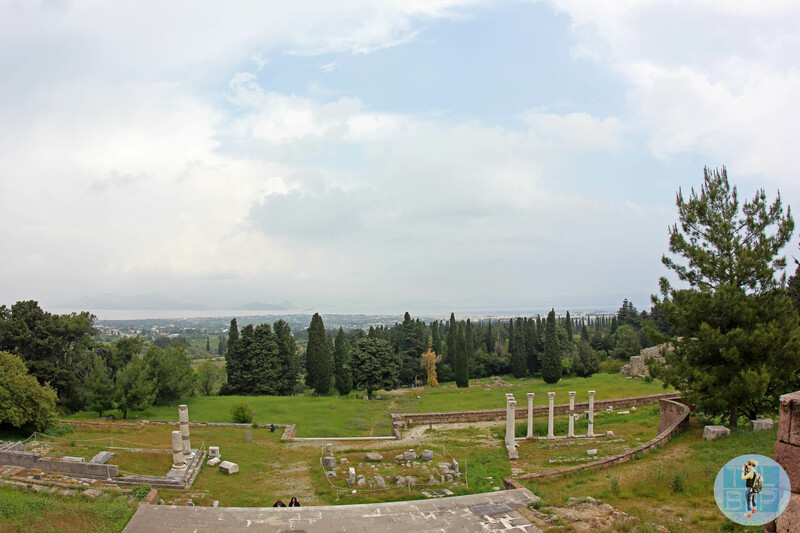 This is the ancient site of Hyppocrates – the founder of modern medicine. Here lies the ruin of the world’s first hospital which dates back to 3rd century BC. Visiting here reminded me of visiting the Temples of Angkor, you really have to use your imagination as to what it would have looked like in its prime. The site is located 3.5km from Kos Town and is built over three tiers which boast beautiful views of the Turkish Coast. The site was struck by an earthquake in the 5th century and was ‘lost’ until its discovery in the 20th century. We walked here on foot from Platani. This is the biggest town on the island, where most big boats will drop you and home to many hotels. This was the busiest town on the island during our shoulder season visit and I can imagine how hectic it gets in summer. Kos Town is full of quaint, pretty streets, beautiful mosques and churches and a lively harbour –especially during the morning when the fishermen are selling their catch. 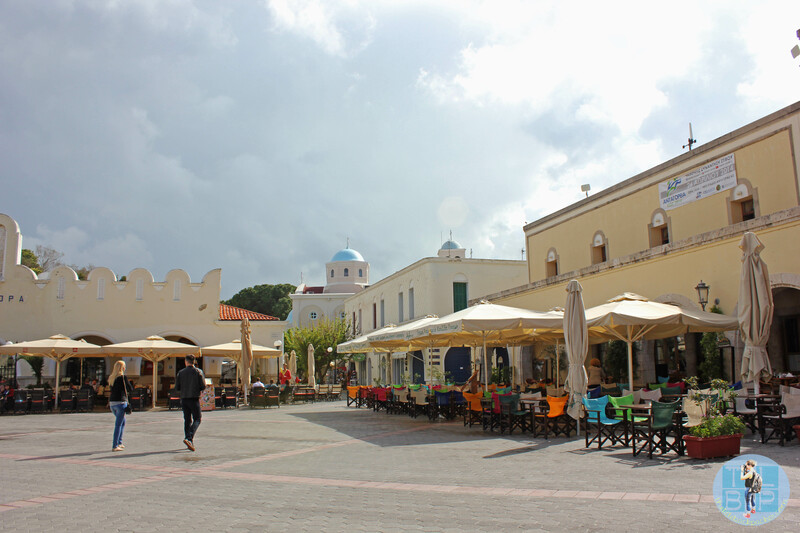 My favourite place in the town was Kazouli Square and all the cafes surrounding it. There are many ancient sites in the town too. 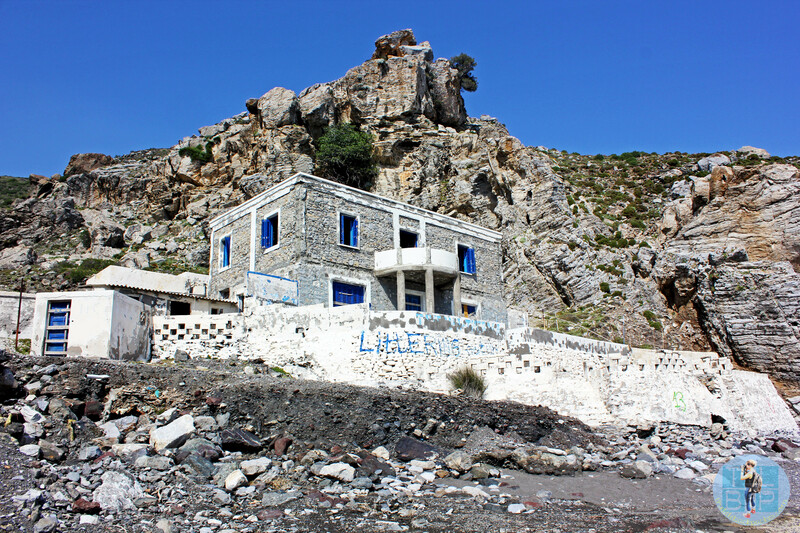 This small beach town is 10k from Kos Town and during our shoulder season visit was empty. I think the only people we saw were locals doing up their business’ for summer. We suddenly felt very silly for not being prepared with food and water. The beach is beautiful white sand and very clear sea – although completely deserted during our visit, I saw beach side stalls, bars and loungers for use during the busy summer. We cycled here from Kos Town along the small back roads. 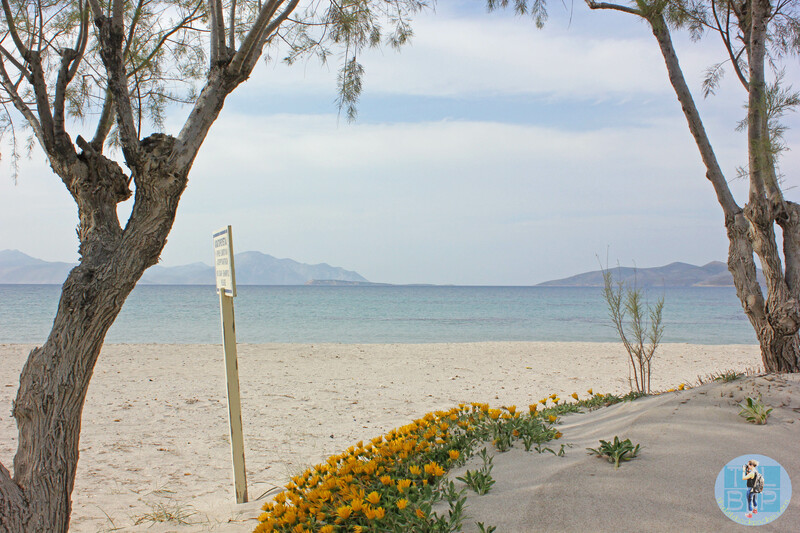 Another little beach town just 4 km along from Tigaki, also accessible by bike from Kos Town. Again it was deserted in April when we visited, except for the locals working on their properties. We sat on the beautiful beach for a while looking out to more Greek islands in the distance and admiring the brightly coloured buildings behind us. This area seemed to be popular for horse riding on the beach with signs scattered along the roads. Mamari seemed smaller than Tigaki but I may be wrong on that. This quiet and beautiful town is totally different in the shoulder season compared to summer. We experience a sleepy town waking up, a beautiful but quiet harbour backed by small but pretty alleys. The mountain hovers in the background surrounding the town and the water is so clear. In the summer this town is 24/7 partying, with more clubs located here than anywhere else on the island. This is your 18 year old tourist nightmare with drunks lingering around from day to night. I loved this town but could imagine I would have a completely different view in the summer. We visited Kardamena during our day of renting a car. 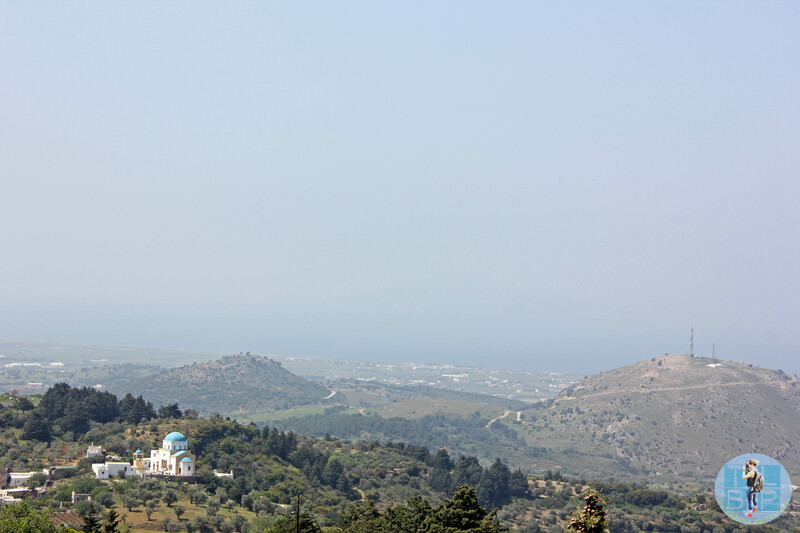 This town is furthest away from Kos Town and requires a steep uphill drive to reach the main town. Visiting the beach is much easier and you will probably recognise it from half the postcards in Kos. There is a tiny island jutting out of the sea not far from the mainland with a beautiful church built there – It seems to be the most photographed part of Kos. I wasn’t particularly taken by Kefalos but then nothing was open and the clouds were covering the sun. There is a lovely bay of beaches before you reach Kefalos which are worth visiting. These beaches and Kefalos were our first stop in our rental car. This is the mountain village and the highest village on the island, views from here are incredible and I feel silly for not coming here to see a sunset. During our visit it was all very quiet but you could see there were many places waiting to be opened. 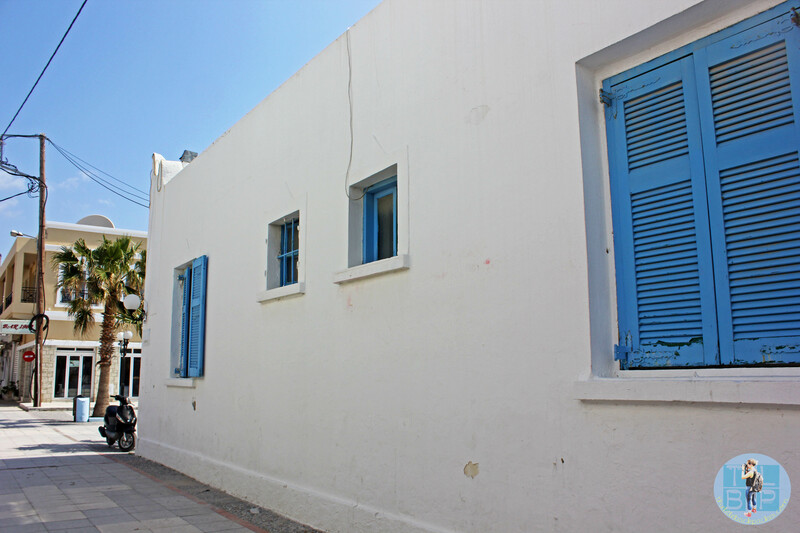 Zia was a ‘typical’ Greek village with beautiful blue and white buildings, cobbled streets and very friendly locals despite my horrific driving! Zia is located along some very steep and windy roads the only way I would recommend getting here is via car like we did. We literally just drove though this tiny village, located further down the mountain from Zia but still nestled above sea level. Pyli is highly rated among many and according to our Airbnb hosts has turtles – we never found them though. Pyli was full of road works and just made the driving very stressful for me! This was our last stop with our rental car and we very nearly didn’t find it! I was merrily driving along the road towards here when suddenly the road comes to a halt with no entry signs for the rest of it. Very confused we stopped in the car park and had a leg stretch – I then spotted people with towels wandering down a track. Deciding it was worth a shot we grabbed our stuff and headed down, to my delight we found the thermal beach we were after. The building seemed destroyed despite seeing a postcard of it looking beautiful in a previous summer and there was nothing else at the beach but none of this worried us or the handful of people that were also down here. It was much like Hot Water Beach in New Zealand except this wasn’t as warm and very stony – still worth a visit. Our Airbnb host Kiki had a friend who worked at this rental place so they organised this all for us. We picked the car up around 8.30 am on the day, handed over our licenses to photocopy and paid the €30 for a day’s hire. The car was ours until 8pm, we were shown where everything was in the car and told that we had to put petro in and return it empty. I hated the silly petrol rule – I mean how are you supposed to know how much you will use in a day?! Otherwise the company were great, the car was simple but reliable and the cost seemed very cheap to me. Normally you get stung with insurance costs on top but they were included in the mere €30. For a cheap run around car for the day Safari Car Rentals was perfect. They are located in Kos Town. Have you been to Kos? Where did you explore? That is a silly petrol rule! did you end up wasting money on it?